As a church, First Presbyterian not only tries to provide opportunities for people to grow in their personal faith, but also wants to be a visible part of the community. The Church believes strongly that we are called to be in the world and wish to be of service to the community we are a part of. 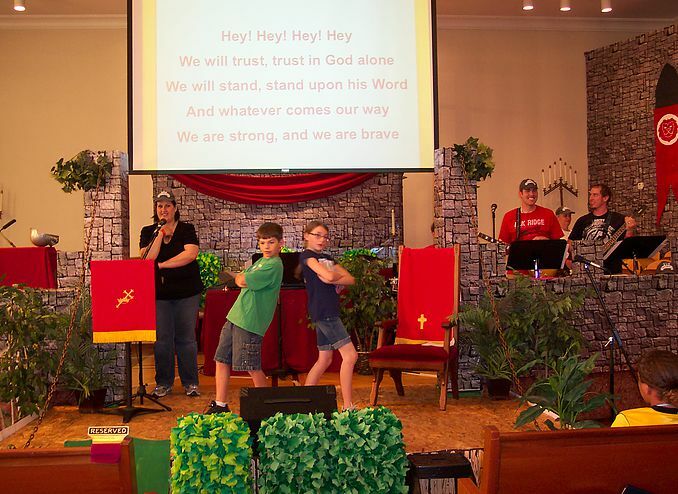 We have participated in the VBS programs Kingdom Rock, Pandamania and Cave Quest just to name a few. As the name implies, having a “Souper Bowl” means collecting food for those in need, and First Presbyterian has been celebrating this annual event for many years now. During this time, a friendly rivalry has developed between Trinity Presbyterian, Ogden Christian Church, and First Presbyterian Church to see who collects the most food. In the past, the food has been donated to SHARE, Inc. This year, we will be selecting another organization as SHARE was dissolved this year. The annual “Kirkin’ O’ Th’ Tartan” worship services feature bagpipe music, flags and banners, and the blessing of many Scottish Clans. The public is invited to join in the worship and a celebration of Scottish heritage. After the services, there are Scottish treats available. The Presbyterian Women’s Association of the First Presbyterian Church hosts its annual rummage, which has been a community tradition for more than 50 years. Items available include clothing for all ages, books and DVDs, bags and backpacks, shoes and boots, sporting equipment, home decorations, household linens, games and toys, small appliances, kitchenware of all types, and holiday decorations and boutique items. Some antiques and collectibles are included, and most items are in new or nearly new condition. Nestled in the heart of the beautiful Wasatch Mountains, Camp Utaba is a short 30-minute drive up Ogden Canyon. You will be delighted by the quality of the meals provided by the camp staff and eaten family style in the lodge with your church family and friends. You will be inspired by the music and worship, the adult, teen and children’s discussion sessions and spending time alone with God.